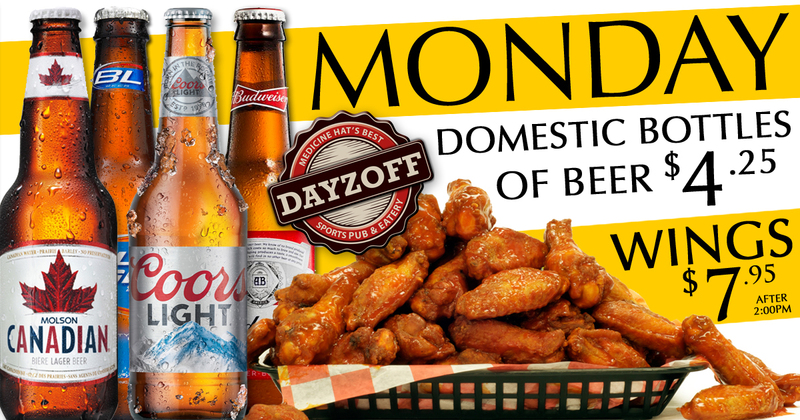 Every Monday you can enjoy a POUND OF OUR FAMOUS CHICKEN WINGS FOR ONLY $6.95 (after 2:00pm). It's a great way to end the work day! We also have BOTTLES OF DOMESTIC BEER ON FOR $4.25! Tell your friends, tell your family, it's time to drop by on your way home! 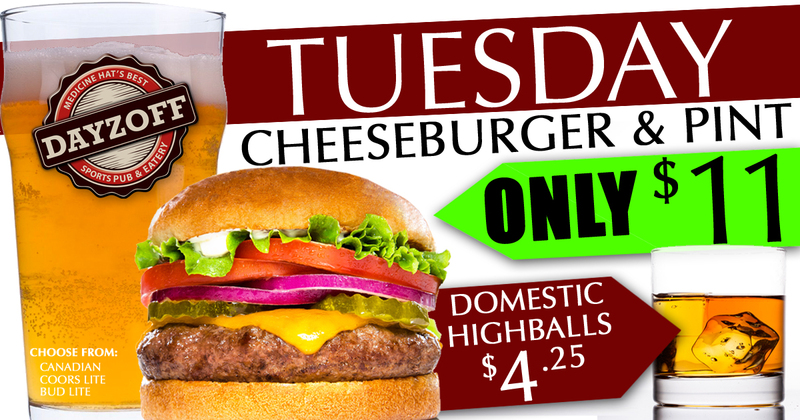 Tuesday's we have our CHEESEBURGER & PINT OF BEER on for ONLY $11.00! Enjoy a delicious FRESH burger and wash it down with a nice cold beer. Choose from Molson Canadian, Coors Lite, or Bud Lite. We also have all DOMESTIC HIGHBALLS on for $4.25! Get in here, grab a good seat and have a great night. Ned a cure for the mid-week blues? 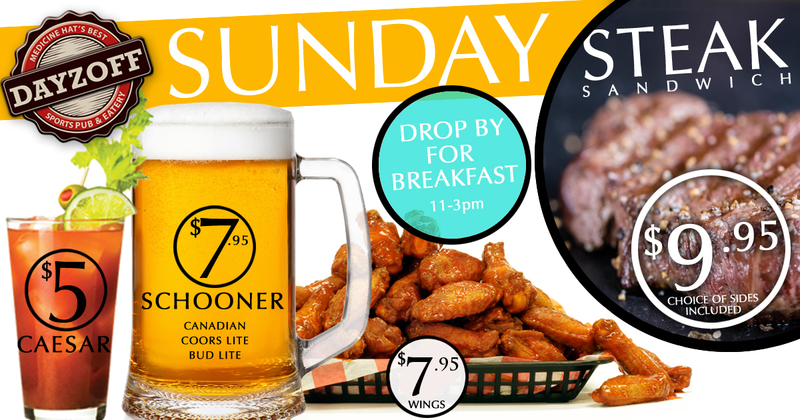 Swing by on WING WEDNESDAY and enjoy a FULL POUND OF WINGS FOR ONLY $6.95! We have OVER 25 flavours to choose from! You've made it that much closer to Friday, it's time to treat yourself! Looking for a place to go for dinner this Thursday? Looking for something that tastes great and is affordable to boot? 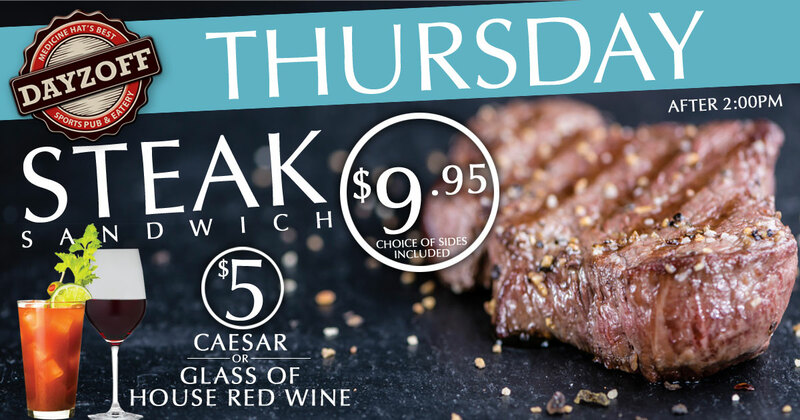 On Thursday's our STEAK SANDWICH is on special! Enjoy a nice tender piece of beef, served with garlic toast and your choice of side for ONLY $9.95! While you're here, enjoy a glass of our popular house RED WINE, or one of our signature CAESARS for only $5/EACH! FRI-YAY! Thats right it's Friday and that means another long week of work is OVER! We have our STEAK SANDWICHES ON FOR ONLY $9.95 including your choice of sides! Come and enjoy a tender piece of beef cooked to perfection! Thinking about meeting friends after work? Not sure who has the best drink and food specials in town?...... WE DO! Enjoy 5 ICE COLD BEER with friends for ONLY $17 A BUCKET! We know..... we aren't your typical breakfast place, but we have GOOD NEWS! 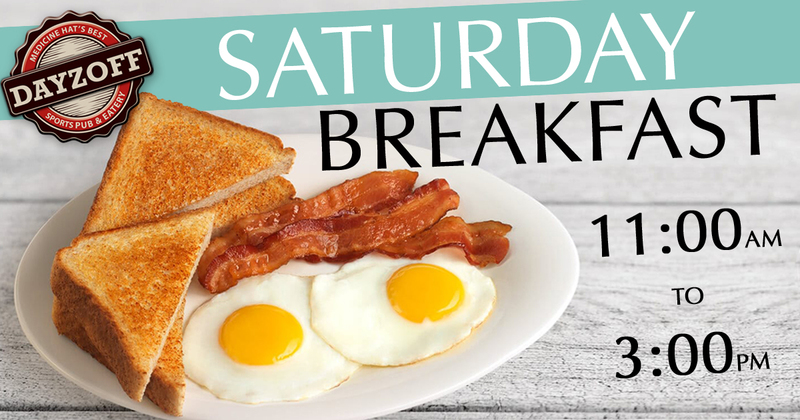 Every Saturday come in and enjoy a fresh HOT BREAKFAST SERVED FROM 11:00am until 3:00pm. Who doesn't LOVE A GREAT BREAKFAST to start off the weekend! SUNDAY IS FUNDAY AROUND HERE!!! 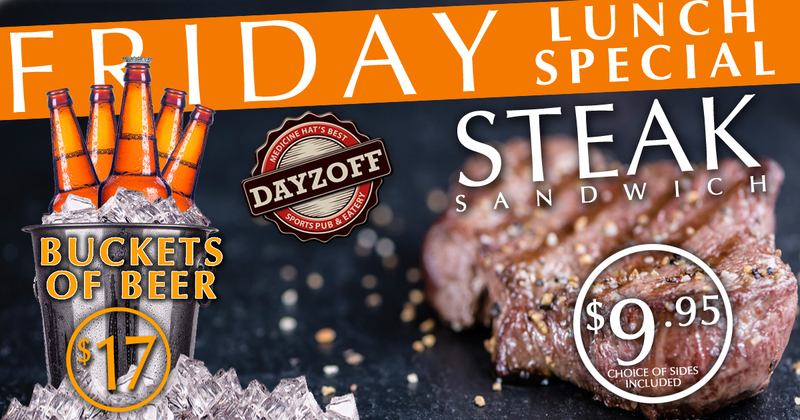 We have LOADED up the specials at DAYZOFF PUB, EVERY SUNDAY! Come and enjoy our signature caesers for ONLY $5 or take down a SCHOONER OF ICE COLD BEER in a frosted mug for ONLY $7.95. Hungry? We've got that covered TOO! BREAKFAST IS SERVED FROM 11:00am - 3:00pm. Or enjoy a STEAK SANDWICH served on garlic toast and your choice of sides for ONLY $9.95. Looking for something a little lighter? 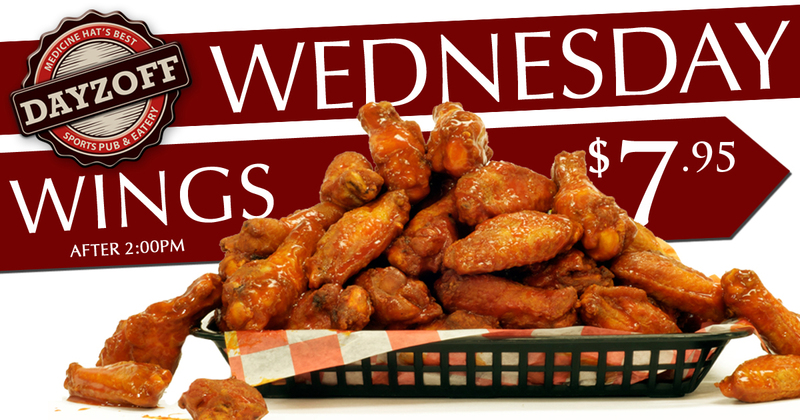 We have our famous CHICKEN WINGS ON FOR ONLY 30 CENTS EACH! We have a HUGE VARIETY OF CHICKEN WING FLAVOURS TO CHOOSE FROM!